As a mother expecting her first child, one of the most overwhelming decisions you’ll have to make is knowing what items you will need as soon as baby arrives. So, what are the must-haves for every new mom outside of the obvious diapers, bottles and clothes? What are the items that will truly make your life easier while taking on the most difficult job in the world? Every new mom will need the Arm's Reach Co-Sleeper, the Ergo Baby Carrier and the Medela Freestyle Breast Pump. These 3 items are all easy to use, have received rave reviews from veteran moms and are all designed with moms on the go in mind! Since babies are not always happy in a stroller and often want to be carried, mom needs a safe and comfortable baby carrier that won’t leave her with a sore back at the end of the day. 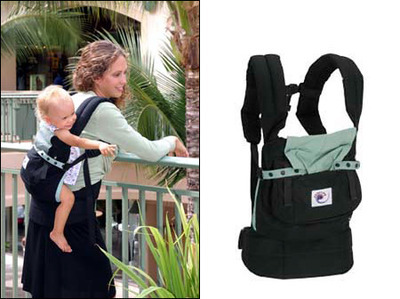 The Ergo Baby Carrier’s ergonomic design is perfect for every mom and baby alike. It has one inch, high density adjustable foam shoulder straps along with adjustable chest straps fit both mom and dad. The carrier is made out of durable cotton and cotton poplin to provide support and comfort for baby. It can be used as a front, back or side carrier and even comes with a zippered front pouch to hold mom’s keys, wallet and cell phone. The Ergo Carrier also has a unique sleeping hood with elastic that grows with baby. If you’ve tried other carriers that seem tight and uncomfortable, you’ll be relieved to find that the Ergo has high quality buckles supporting the waist and back that fits a waist circumference of 25” to 43”. Regardless of how small or large you are, the Ergo will fit comfortably on you in any of the three positions you decided to use it. While most carriers are only fit for babies up to 35lbs, the Ergo Carrier has the durability and strength for children up to 90 lbs. No other carrier on the market has been tested for such high durability and strength. It has reinforcement stitching at all fabric intersections and it’s machine washable. Additional items such as sucking pads, an infant insert and extra front pouch are also available to accompany the Ergo Carrier. When it comes to baby’s sleep, comfort is key. The Arm’s Reach Co-Sleeper Bassinet is recommended by the renowned baby guru, Dr. Bill Sears, and is the ideal place for baby to sleep. The Arm’s Reach Co-Sleeper is a portable bassinet that can be wheeled around your home so baby can be near you whether you’re in the shower or in the kitchen. 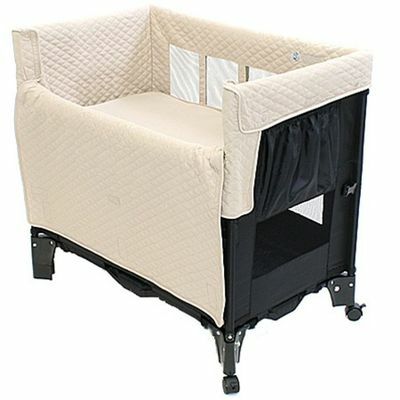 Its free-standing bassinet design feature locking wheels and also come with optional risers. The bassinet adjusts to the height of your bed so baby can sleep right next to mom without having to be in the bed. It also converts to a play yard so you get two products in one. The Arm’s Reach Co-Sleeper Bassinet includes a removable fabric liner, mattress, fitted sheets and a travel bag. Overall, you could not ask for a more diverse baby product. Instead of purchasing a crib, play yard and travel bassinet for those weekends away visiting family, you can just purchase the very affordable Arm’s Reach Co-Sleeper Bassinet and get three products for the price of one. It even fits in the overhead luggage compartments of most commercial airlines. The Arm’s Reach Co-Sleeper Bassinet can be used until baby is 30 lbs. in the bassinet position and 50 lbs in the play yard position. While a car seat, stroller and bassinet are all essentials for baby, a mom must also have a breast pump to provide for baby’s nutrition at all times. Many moms today are working moms that are away from home for long periods of time. Others are stay at home moms that are often too busy with laundry, dishes or cleaning to have spare time to pump. The Medela Freestyle breast pump is ideal for both working and stay at home moms alike. Its unique, portable, compact design make it the ideal pump for any busy mom. It features 2 phase expression technology to mimic the let down stimulation that a baby provides. It also comes with a convenient bag and a rechargeable battery with an ultra-lightweight motor that are perfect for active moms. The Freestyle even comes with an optional 12V vehicle lighter adapter so you’ll never be without power. The hands free option that comes with the Freestyle connects directly to any nursing bra making for true pumping mobility. If you’re at home, at work or even on the road, you’ll be able to easily attach the freestyle to your nursing bra and pump no matter where you are. Becoming a new mom is demanding enough and, at times, hectic for most women. Family members and friends are constantly giving them advice and telling them something else they’ll need to buy or do in order to be ready for baby’s arrival. Having the Ergo Baby Carrier, Arm’s Reach Co-Sleeper and Medela Freestyle Breast Pump, in addition to the obvious diapers, bottles and clothes, will make mom’s days after delivery go a lot smoother and baby’s first few days in this world a lot more comfortable. Being a mom is a difficult job, deciding what you’ll need to prepare it shouldn’t be.